My computer hates me... I spent ages editing the photos for this post and then when I quit Photoshop, none of my photos had saved! And so I wanted to put the originals in a folder to edit later, but my computer wouldn't let me rename the folder! And I couldn't copy and paste, couldn't move anything to my trash!!! But I did the classic fix, turn it off and on again... And all my photos were there on my desktop all of a sudden! Anyway, here is something a bit different, I'm a bit nervous actually, taking these pictures was so hard so I hope everything came out okay! Recently Superdrug had a free gift with purchase (or 3 for 2 - I can't remember!) offer on Rimmel products and I got this eyeshadow pencil. 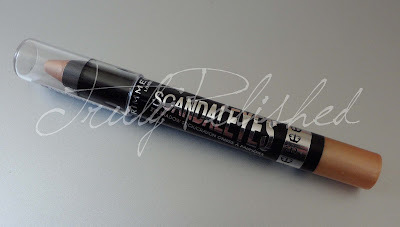 I bought it with the Scandaleyes black kohl pencil and one of the Apocalips lip lacquers, both of which I love, Rimmel have some great products out right now. 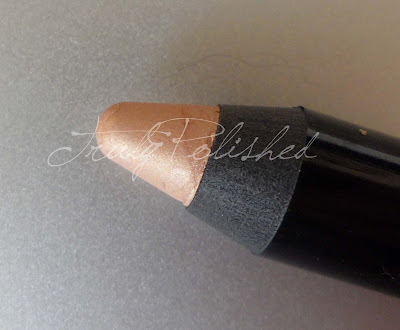 Bulletproof Beige is a jumbo eyeshadow stick. 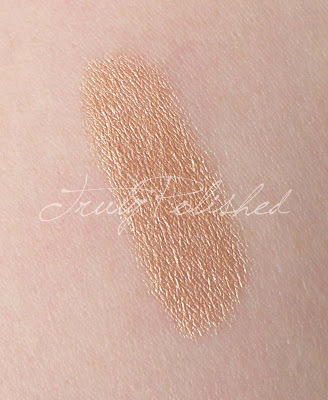 It is a creamy champagne/gold colour that would flatter most skin tones. Onto the photos, then I'll get into more detail! I am a huge fan of the application of these. I just drew some on my eyelid and smudged it with my finger, perfect! I liked how this looked on me, but I didn't think it showed up enough against my skin to wear on its own, so I decided to use it as a base for the other eyeshadows I wanted to wear. I used a couple of the shades from the MUA Undressed palette, the dark taupe shimmer for my crease and the peachy matte for the inner corners, then I blended it all. In case you were wondering, the mascara I used was the MUA curling one that comes in the silver tube. This was a very half hearted application though because the eyeshadow pencil made my lashes short. I'm really impressed with the mascara in general, my lashes are VERY short and for £2 the mascara is brilliant at lengthening and curling them! Here's what my eyes looked like with this as a base, obviously I lost a lot of the colour in the photo, this was much smokier looking in real life. 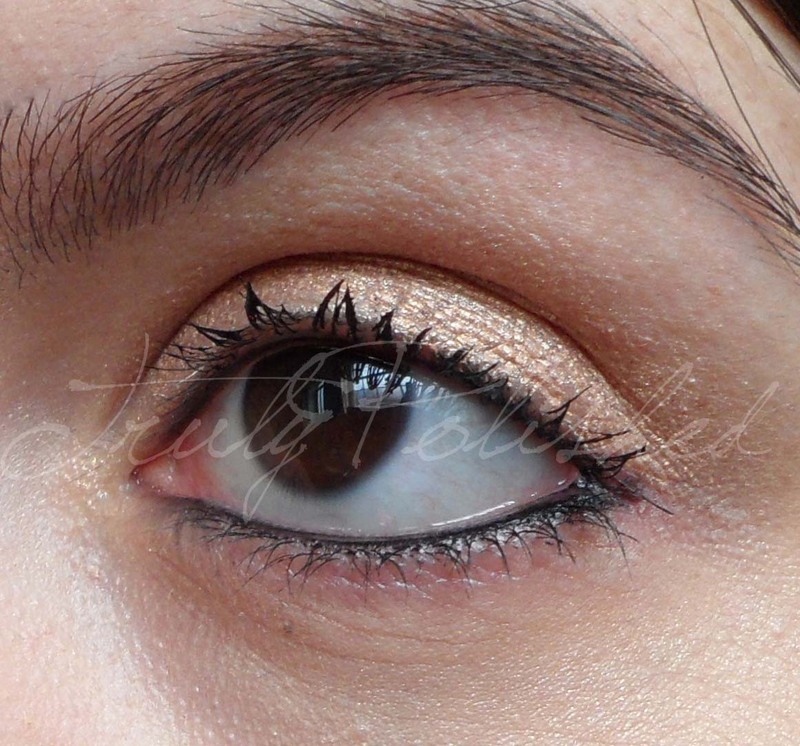 Anyway, I was really impressed with this as a base, my eyeshadow didn't budge all day until I look it off this evening! It looked really nice under the colours that I used and I'm generally really happy with the product! No settling into the creases, nothing. 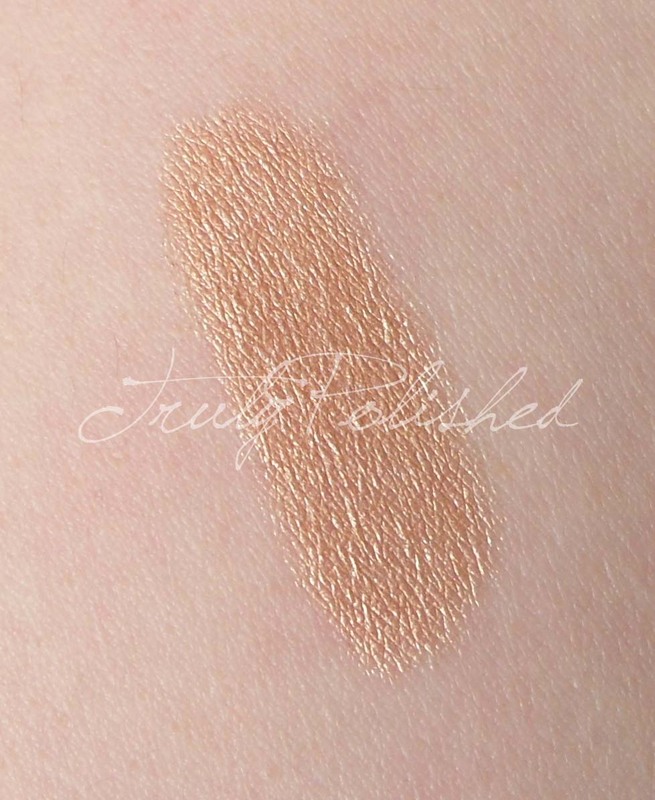 It is a subtle colour that I think would look great no matter what eye colour you have, and I can't wait to wear it in the summer when I have a tan! Have you tried any of these shadow sticks yet? I think I'm going to get a couple more, the bronze one and the black are calling my name! 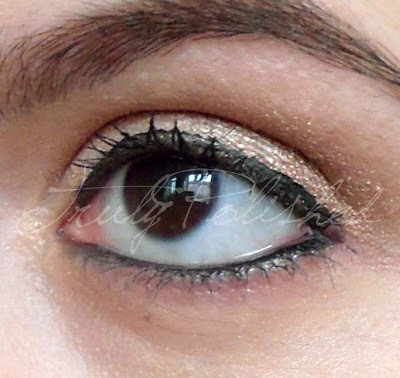 I can imagine the black one would be a great base for darker colours for a night time look. The Rimmel Scandaleyes Shadow Sticks retail for £5.99 and I highly recommend checking them out!